How much plastic ends up in our rivers? And what are the effects on our health and the environment? A group of Italian citizens and scientists have come together to try to answer these questions. 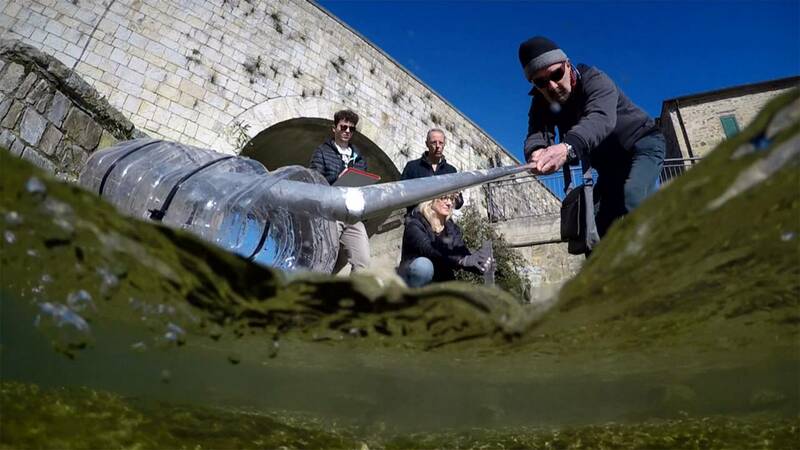 Several times a year, the inhabitants of Sambuca and other Italian municipalities visit dozens of test sites along local rivers to assess the level of pollution in the water. This example of 'citizen science' provides a wealth of interesting data while at the same time raising public awareness about environmental conservation. "We conduct three types of observations: two are made with chemical reagents that determine the nitrate and phosphate content and the third is a visual analysis that measures the turbidity of the water," says Marco Giunti, one of the volunteers. The volunteers collect and log plastic litter — a common source of microplastic pollution carried by rivers into seas and the oceans. Other sources, such as urban wastewater or industry, can be indicated by various combinations of chemical pollutants. "We note what type of plastic waste we found on a given site: we record everything in writing and online thanks to a specific mobile application," explains Andrea Vanni, a young volunteer. The data collected by citizen scientists are then studied within a European research project, POSEIDOMM, which uses laboratory instruments to find microplastics in water samples. The water from the river is passed through a paper filter which is then heated in a special instrument up to 900 degrees Celsius. As the filter heats up, different compounds volatilise at different temperatures. The precise scales inside the instrument measure the changes of the sample's weight at each temperature, indicating the type and weight of microplastics present. "We want to identify them to develop methods to reduce their presence as they seriously threaten all aquatic fauna and flora, the whole ecosystem," notes Gemma Leone, professor of general chemistry at the University of Siena, one of the project's partners. To learn more about the biological effects of microplastics, the researchers use so-called microcosms — glass cuvettes with microbial life incubated for a certain period under simulated sunlight. Luisa Galgani, a researcher in environmental spectroscopy and one of the lead scientists of the POSEIDOMM project explains: "Inside these cuvettes, we put micro-particles of polystyrene to observe the effects of the interaction of these micro-particles with the organic matter. We check what happens when we expose them to the light in order to simulate, as realistically as possible, the conditions of the ocean surface layer which is exposed to solar radiation." The molecular changes inside the microcosms are measured using nuclear magnetic resonance. This allows to better understand the effects of microplastics on biological and chemical processes at the marine surface — a crucial problem now that this relatively new and poorly understood pollutant is being detected across the globe. "There's still a lot to be learned. We're just at the first part - we're quantifying what goes in there" says Steven Loiselle, POSEIDOMM project coordinator. "We really don't understand where a lot of it ends up. We don't understand what effect it's having on fauna - we understand some aspects, but not on the whole biological, chemical system that is our aquatic water bodies."